My description of the quantum mode number "p" for the longitudinal direction of a cylindrical cavity in http://forum.nasaspaceflight.com/index.php?topic=36313.msg1318217#msg1318217 should be corrected from "number of full-wave patterns along the longitudinal length " to "number of half-wave patterns along the longitudinal length "
The first subscript (m) is the azimuthal mode number: it indicates the number of full-wave patterns around the circumference of the cylindrical cavity. It is zero for modes in which there is no variation in the circumferential direction. The second subscript (n) is the radial mode number: it indicates the number of half-wave patterns across the diameter. The radial mode number (n) plus one indicates the number of nodes across the diameter (counting as nodes the end nodes). The radial mode number (n) minus one indicates the number of middle nodes across the diameter (not counting as nodes the end nodes). The radial mode number (n) cannot be zero. The third subscript (p) is the longitudinal mode number. It indicates the number of half-wave patterns along the longitudinal length of the cavity. It is zero for modes in which there is no variation in the longitudinal direction. I double-checked the others (m and n) and I am sure that they are correct. The US Navy reference is correct. GO NAVY ! Concerning, "m" "the azimuthal mode number: it indicates the number of full-wave patterns around the circumference of the cavity, all the descriptive references you brought up agree (as we previously discussed in this thread). Concerning "n" (the radial mode number that "indicates the number of half-wave patterns across the diameter"), the Wikipedia link is incorrect -I didn't have the time to check the history of that Wiki entry to see what is the history of that Wikipedia error. When I have the time I will examine that and I will correct the entry in Wikipedia. 2) In the radial and longitudinal directions, the boundary conditions (electrical conductivity at the surfaces) are at each end of the diametral direction or at each end of the longitudinal direction. There is no boundary condition at the center of the circular cross-section other than symmetry or antisymmetry (unless it would be a double-concentric cylinder having an inner conductive cylinder in addition to the outer conductive cylindrical surface) hence a half-wave can be supported within the diameter direction and a half-wave can be supported within the longitudinal direction. Hence the radial and longitudinal directions n and p are the number of half-waves in both directions, just like a rectangular cavity. I have not had a chance to look at your Coke can for the numbers in KWOK yet. I found this very interesting (expired) 1969 patent by Wolf, owned by JOHNSON CONTROLS INTERNATIONAL, that deals with conical cavities ! The naturally conforming reflecting end for a conical Wave-guide is such a sphere, just as the conforming end for a cylindrical wave-guide is a flat plate. It is believed that the reason that the spherical end is superior is that fewer higher order modes need be excited in reflection from such an end than from a fiat end, or that the degree of such excitation is less. It is further believed that higher order modes can be excited in the large end of the resonator which are undetectable through the input and output structures located at the small end, where these modes are below cut-off. They are however, detectable in that such coupling between modes may cause a reduction in the Q factor of the desired mode. Since the curvature of the end plate cannot be altered as the resonator is tuned, the curvature of this end plate is also a factor which does not scale during the tuning of the cavity. It thus will cause slight perturbation of the modes. It appears to be possible to employ this perturbation to offset the effects of the perturbation due to the gap around the plunger, which also varies during tuning. This generally requires empirical adjustment of the plunger radius of curvature until the Q factor remains good over the tuning range. As a feature of the third concept, an absorber is provided in the back cavity, behind the plunger or base plate and around the rim of the base plate. Successful use has also been made in experiment of grooves made in the face of the plate and partially filled with absorbing material. EDIT: it is interesting that the only EM Drive with spherical end sections is the 2014 superconducting design by Shawyer, who after his experience with the more traditional designs has now: 1) replaced the flat ends with spherical ends, 2) discarded the adjustable end, 3) adopted piezoelectric compensation for Doppler shift, 4) uses superconductive inner surfaces to get much higher Q, 5) reportedly (according to @Wembley) discarded the dielectric and 6) it has a length smaller than both the small and big diameters. I find myself wondering: Shawyer has been at this for a long while, and seems pretty bright. So...did he discard the dielectric for good, or is he just doing 'prep work' of some sort that doesn't require a dielectric at the moment. I figured out the confusion I had over the m subscript after studying the KWOK 3.01ghz coke can, and the 2.45ghz example. The issue is, wavelengths is NOT the same as wave pattern. For both the frequency examples, you get pretty much exactly 2 wavelengths around the circumference, which breaks TE111. So wavelengths is where I got it wrong. My old n subscript was jacked up too. As the Navy example states, and @Rodal did too. It is wave PATTERN. Glad I got that sorted out. So the Navy example is correct, and then add the p subscript from my old post, and it all falls in to place, as Rodal typed it out above the Navy logo, which is perfect. So around a circumference there is of course no E field boundary condition, so trying to quantify it in wavelengths makes no sense. Pattern variation does. On the other hand, across a diameter or along the length, standard E field boundary conditions apply, so pattern or half wavelengths works equally well. I'm being super cautious before I sink cash on a large copper sheet, so I'm testing everything. Thanks again @Mulletron for bringing up this issue and the joint effort. This was a great collaboration. 1) discuss the issue of modes in a cylindrical cavity (using the Volumetric Mean) in comparison with the actual modes of a tapered cone (frustum). I would like to post some information on this. I need time to post it. Hopefully we can discuss it during the next few days. 2) Calculate the cyindrical cavity mode shapes for the Shawyer Experimental and Demo based on the Volumetric Mean. Then post the mode shapes for all the cases: NASA Brady and Shawyer, to compare. 3) Calculate the @NotSoSureOfIt expression for NASA Brady and Shawyer Experimental and Demo and compare it with McCulloch's and Shawyer's calculations. 4) I plan to eventually write a program in Mathematica to analyze the tapered cone, but I'm not going to have time for that until weeks from now at the earliest, depending on how much extra time I get. I was wondering if this phenomena might have an effect on this system? I've attached a video that Tom Ligon made for me some time ago. Can anyone tell me what mode this is, in particular, what is "p" . As for the operating frequency - it is consistent within meep and Harminv but these last few pages of discussion have shaken my confidence that it is consistent with the real world for those cavity dimensions. The cavity is similar to the Brady cavity in perfect metal, but the dielectric constant is to high. I don't expect to make a new video until I get the frequencies and modes sorted out. Edit: add cite to the trailer of video. 1) Only the longitudinal-radial (z, r) cross-sectional area (perpendicular to the circumferential direction) is shown (at a fixed azimuthal angle), and it indicates that p=3 since there are three half-wave patterns along the longitudinal axis. 2) The circular cross-section is not shown in the video and therefore there is no way to tell what the circumferential "m" quantum number of the mode shape is. One needs a circular-cross section contour plot (the cross-sectional area perpendicular to the longitudinal direction) in order to ascertain what m is, and to make sure what is n. It would be interesting to supply at least 2 cross-sectional circumferential plots: one located at the longitudinal-direction-middle section of the dielectric and the other one in the empty section of the cavity to compare the field in the dielectric and the rest of the cavity. 4) It is interesting that the two interior nodal lines separating the longitudinal half-wave patterns are spherical even though the ends are flat. It really shows that the cone mode shapes naturally prefer spherical ends, as in Greg Egan's solution, and as discussed in the 1969 Patent by Grant I posted previously. The flat ends of the EM Drive degenerate the natural mode shapes of the cone cavity. I've had a chance to go through these papers over the weekend. I didn't see anything that would rule it out. The most encouraging aspect is the inclusion of Rindler-like coordinates ie. accelerating frame of reference. The shape-maintaining requirement is met by the physical cavity. Still a long way from obvious. Observe that shawyerExpVolumetricDiameter is just 0.21 % greater than shawyerExpMeanDiameter, and 0.86 % greater than shawyerExpGeometricMeanDiameter. Observe that shawyerDemoVolumetricDiameter is 2.25 % greater than shawyerDemoMeanDiameter, and 10.05 % greater than shawyerDemoGeometricMeanDiameter. The difference between the mean diameter measures is much greater for Shawyer's Demo than for Shawyer's Experimental because Shawyer's Demo has a greater difference between the small and big diameters. for both Shawyer Demo and for Shawyer Experimental. where Xm,n is used for TM modes and X'm,n is used for TE modes. 1) At the frequencies tested by Shawyer, what mode-shape corresponds to a given frequency is very sensitive to the exact geometrical dimensions of the cavity. The reason for this is that there are many natural frequencies very close to each other, each of these frequencies having different mode shapes. It would be difficult to predict what mode shape one will get with a given geometry at these frequencies, because small variations in geometry lead to large changes in mode shape. Therefore a dielectric is needed to force a circumferential-cross-section-mode-shape or moving-end to adjust the length of the cavity. Certainly it would be very difficult to predict the mode shape of an empty cavity with the coarse finite element model used by NASA Brady et.al. or with a Finite Difference code like MEEP (There are no Bessel functions in a finite element or finite difference model: the solution is approximated with low power piecewise polynomials in each finite element. The finite element solution is a Galerkin solution "in an integral sense" and not an exact partial differential solution "point to point through the domain".) Finite Difference solutions (like MEEP) have even more discretization and convergence problems than Finite Element models. 2) Both with the Geometric Mean and with the Volumetric Mean, all Shawyer cases: the Shawyer Experimental and the Shawyer Demo experiments, correspond to transverse electric (TE) mode shapes: the electric field is in the circumferential direction and the magnetic field is perpendicular to it. I think that the TE mode shapes are the ones that should provide thrust because it is only the TE mode shapes that have the magnetic field directed along the longitudinal direction of the EM Drive. Physically, an axial magnetic field may result in a measured thrust either 1) as an artifact, because the magnetic field can heat the flat ends of the truncated cone by induction heating and hence produce thermal buckling and other heat effects or/and 2) as a real means of propulsion, by the magnetic field coupling with the Quantum Vacuum, among several possible physical mechanisms. 3) Using the volumetric mean leads to lower errors than the geometric mean. 4) No dielectric was considered, and it is unknown whether Shawyer used a dielectric and if so what material and geometry of dielectric, for these experiments. The dielectric will produce an extra longitudinal half wave in the dielectric region of the cavity, and it should reduce the number of full-wave patterns around the circumference, probably making the electric field constant in the circumferential direction for a TE mode, essentially forcing TE41 into TE01. For the DEMO, Shawyer used an adjustable end, that allowed him (unlike NASA, that did not use adjustable ends) to fine-tune the natural frequency of the cavity. it could be that a = 1, 2, ... or more. I agree that more video views would be interesting, but as I wrote, I don't plan to make more until I get the frequency question ironed out. I'm still working that problem but have determined that it is either an issue with Harminv or with my use of Harminv. But it's not geometry or frequency input values, rather it is signal amplitude, run time and wait time issues. Most likely all of them. In the video I posted, it is clear that the cavity is resonating strongly at the drive frequency. The drive frequency is only moderately near the Brady experimental drive frequency. I took that to be a result of the relatively higher dielectric constant used, 2.3 compared to the 1.76 value that gives the Brady experimental value of 1.8804 GHz. But now I'm not confident of that assumption either. I am looking into ParaView, an open source data visualization tool. With it, I might be able to generate some 3D views of interest but movies are to hard. Making of that movie took 12 hours of CPU, another 8 hours to upload the PNG files to Box, and I don't know how long to download and make the movie, then send it back. To hard just for simple exploration of the data. I think that X is most likely to be E (because you have a dielectric in the cavity) and that m is low (because you have a dielectric in the cavity). Absolutely, we do NOT need a movie, we only need the very last still picture, since we are only interested in the steady-state standing-wave. I wonder about the reason why you get much better results for the truncated cone case with the dielectric (compared to experimental frequency) than with the cylindrical cavity with no dielectric (compared to exact solution). I wonder whether the reason for this is that the matrix that needs to be inverted in MEEP is numerically ill-conditioned (because there are many mode shapes very close together, actually the frequencies for mode shapes TE01p and TM11p are identical ! ) and that placing the dielectric makes the matrix much better numerically conditioned (the dielectric forces the mode into TE and low values for m and n ). So, for different reasons (numerical conditioning of the matrix to be inverted in the case of MEEP and fine-tuning frequency and mode-shape in the case of the real experiments) the dielectric may be beneficial both for the numerical solution and for the experiment. This discovery for cavity cooling of quantum oscillators looks interesting. Could it be relative to the subject of EM drives? So that TE111 has a frequency of 2.63 GHz, as @Mulletron and I compute. Therefore I don't understand why you are inputing an excitation frequency of 2.45 GHz, which does not correspond to any natural frequency, and moreover sits between two natural frequencies: TE110 (2.33 GHz) and TE111 (2.63 GHz). Your excitation frequency of 2.45 GHz is closer to TE110 than to the mode you said you wanted to excite: TE111. By decreasing the cavity length, you made your excitation frequency of 2.45 GHz further away from the mode you said you wanted to excite (TE111). By decreasing the cavity length even further, you made your excitation frequency of 2.45 GHz even further away from the mode you said you wanted to excite (TE111). As you decrease the length , the frequency of mode shapes TE110 and TM010 remain exactly the same (2.33 GHz and 3.04 GHz respectively) while the frequency of TE111 increases from 2.63 GHz to 2.82 GHz, so that your excitation frequency of 2.45 GHz remains at the same distance from TE110 but is further and further away from TE111 as you decrease the length. I'm puzzled as to why you are using an excitation frequency of 2.45 GHz which does not correspond to any natural frequency of the cavity. If you want to excite TE110 you should use an excitation frequency of 2.32677 GHz (using the speed of light in air, while if you use the speed of light in vacuum it would be 2.32745 GHz). The natural frequency of mode shape TE110, 2.33 GHz, is independent of the length of the cavity. If you want to excite mode TE111, which does depend on the cavity length, you should use an excitation frequency significantly higher, as shown above, and as indicated by @Mulletron and me. Furthermore, if you decrease the cavity length, the TE111 natural frequency increases, so you have to increase the excitation frequency to correspond to it, if you want to excite TE111, otherwise, decreasing the cavity length keeping the excitation frequency constant 2.45GHz should make it more difficult to excite TE111 (rather than easier, which is the opposite of what you wrote you were looking for). I found this very interesting (expired) 1969 patent by Grant, owned by JOHNSON CONTROLS INTERNATIONAL, that deals with conical cavities ! It has been found possible to predict the resonances approximately by defining a phase shift per unit length as 21r/ \g, where Ag is given by the usual formula for circular wave-guides of diameter D, but where D and hence Ag vary along the cone. If this phase shift is integrated from the location of the cut-off diameter to the position of the plunger or movable end wall, resonances will be found when the integral has values of 11 pi." Looks like math for predicting resonant modes for cones. It looks like some of the text got messed up in the character translation over to Google patents, see the bold part. 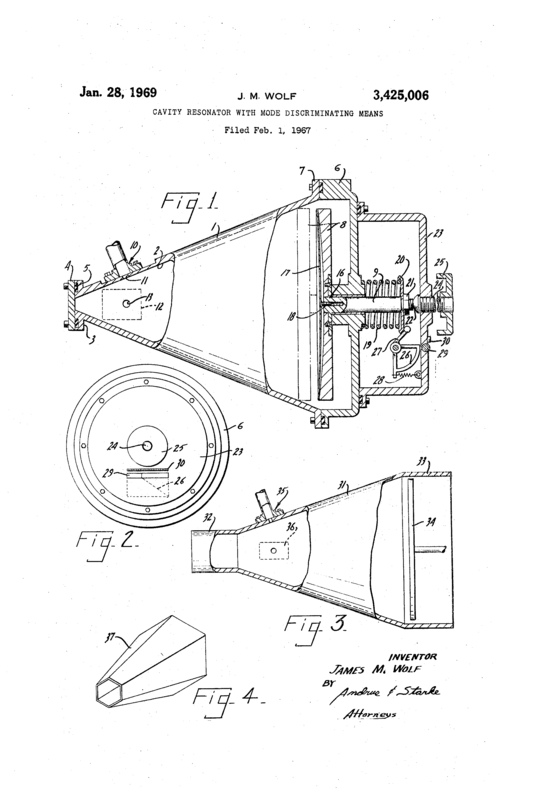 I found this very interesting (expired) 1969 patent by Grant Wolf, owned by JOHNSON CONTROLS INTERNATIONAL, that deals with conical cavities ! Glad you agree that this 1969 patent is a gold mine for people interested in EM Drives. "n * Pi" instead of "11 * Pi"